My Racecapture has never seemed to read data from my AEM Infinity 6 (now called the 506). Is there something I should be setting up on the setup page? I looked it over for a solid 30 mins today and didn't find anything obvious. I did verify the AEMnet datarate is 500k baudrate, which is what I've set mine to. Is there a diagnostic I can do? In the app under settings then scripting menu you can turn on "Poll log" and switch it to "debug". You should then be able to see what error message you get. ...and let us know what you see. Thanks! 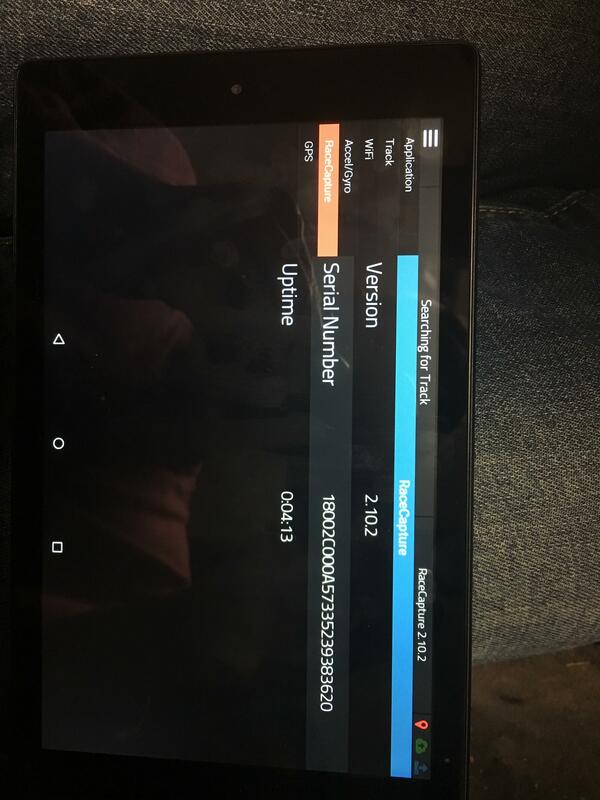 I have the latest Android RC app version 1.8.0 running on an 8" Fire tablet, and I see the Scripting menu before I connect to the RC wifi, but it disappears after I connect to the RC wifi. So I couldn't run the script linked. 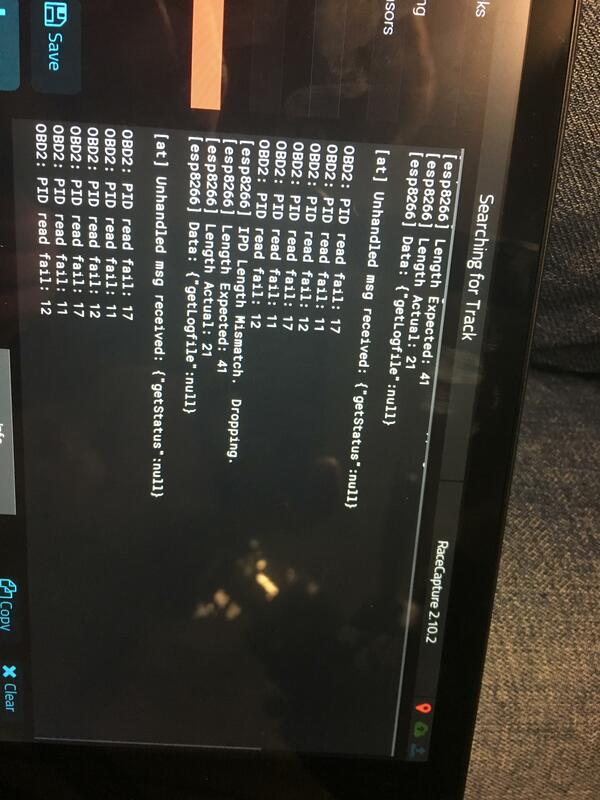 Any info on how to run a script while actually connected to the RC? Or do I need to connect via a wired USB connection while it's connected to the AEM Infinity via the RJ45 cable? Sorry for the huge pics... didn't realize they wouldn't autoscale! So, the OBDII subsystem is trying to read OBDII PIDs - that's what the errors are indicating. Are you trying to read data from an OBDII ECU, or from the AEM? If you're attempting to read from the AEM, then you'll want to turn OBDII *off* in the OBDII settings, as it will take over the CAN connection, blocking the script from receiving CAN data. Hope this helps, let us know what you find out! Brent, thanks for the reply. I wasn't sure on that one, so I've previously tried both with it on and off (and yes, I'm writing after every setup change and reading to verify the config on the RC). 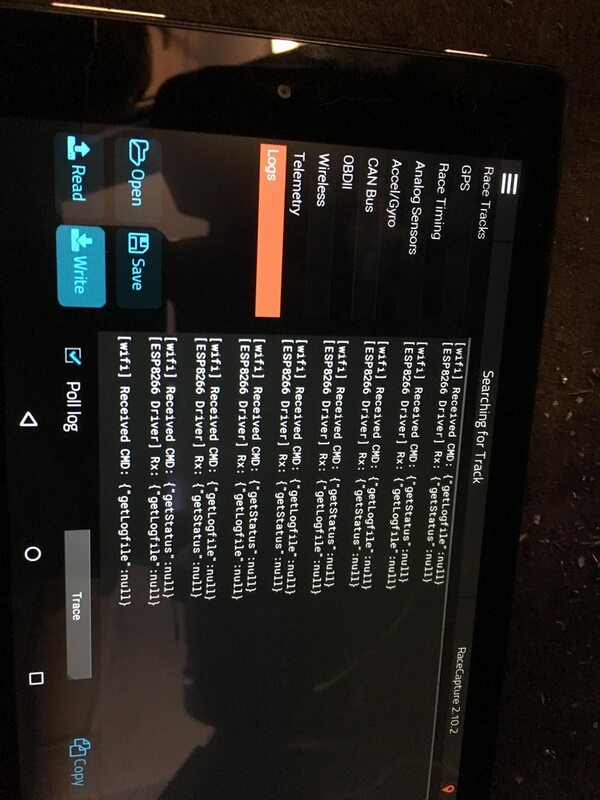 So I got some log screenshots with OBD2 turned *OFF* and CAN turned *ON*. Any ideas? Is the next stop looking at the CAN info being received? Best way to do that? I'm assuming not an Android tablet right? 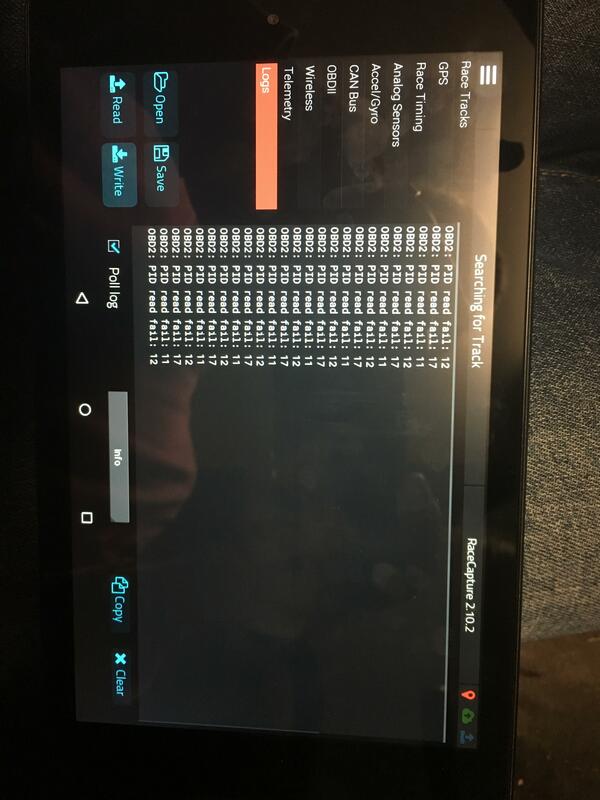 I can't find a way to do that on the Android app - scripting setup submenu disappears when I connect to the RC wifi. This will show if anything is being received by RCP on that CAN channel. As before, ensure OBDII is off, and the baud rates match. Ensure that your CAN termination is correct. Worth noting, RCP has built-in CAN termination on it's end. The scripting submenu goes away when I connect to the Racecapture wifi. See my screenshots for what it looks like when connected. How do I run a script when connected? I am sorry. I thought you were using a RaceCapture/Pro, which supports scripting. 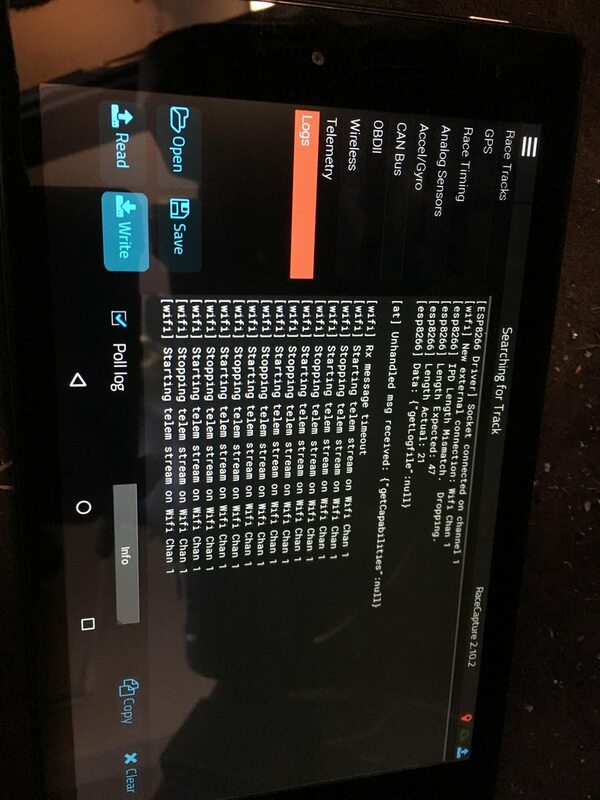 Are you trying to use an OBDII emulation mode from your AEM infinity? At the moment, RaceCapture only supports OBDII PID querying. Next firmware release we will be able to support direct ECU CAN mapping. If your AEM can support CAN OBDII compatible emulation, then it should work in theory. You can confirm RaceCapture's OBDII operation by plugging the RaceCapture into an OBDII port of a 2008+ vehicle. Sorry for the confusion. We'll be posting more about the upcoming firmware that supports direct ECU mapping. Oh... I wasn't aware this wasn't supported out of the box since it was touted as a feature on the Racecapture kickstarter. Any ETA on the new firmware? It is, we were behind on rolling out every feature. It will be available for beta within a few weeks, we expect! It's an important feature and we're committed to it.